I just wanted to start a thread where we can post memories of games we have had, maybe old gaming stories that are not horror stories we would share on an email to Happy Jacks. Just, you know, fond memories of our RPG experiences. 1. My first character was a Techie. He built all sorts of crazy stuff for himself, including what was essentially the Predator's shoulder-mounted, mind control aimed gun (though it wasn't as powerful as that and I didn't knowingly take inspiration from the movie; it was more of a shoulder mounted net-launcher which I had some regular and some electric nets for). We had been sent to Egypt to crawl through a pyramid for something and the bad guys beat us there so there was plenty of combat and traps along the way. I successfully disarmed a grenade cluster hanging from the ceiling wrapped in a detcord net (which is like the CP2020 equivalent of thermite) and added it to my character sheet. We eventually make it to the hidden chamber in the center where we awaken these mystical guardians and an ancient mummy (we'd already done a lot of futuristic stuff, so the GM was changing it up a bit). This was his carefully planned out, powerful, might TPK us BBEG for this arc. You can see where this is going...I put the detcord-grenade cluster-net into my shoulder-mounted launcher and fire at the mummy. Roll damage....killed it in one hit. It was a legendary moment of win that we still talk about, especially since the GM gave me the weapon I killed it with. 2. Another Cyberpunk character of mine was an undercover Cop who was pretending to be a Solo (basically the Fighter/Barb class) - as in, the other players thought he was a Solo and only the GM and myself knew he was actually a Cop. I was just going to take normal weapons to start, but the GM gave me a Cop-only special issue combat shotgun that was super powerful (without any prompting from me). Just like the last time, when we got to the BBEG encounter, I took them out in either one or two hits. Once again, the GM basically destroyed his super badass encounter through through his own actions. This is already long, so I'll post more later once other people have added to the thread. An odd one to start with but I will always remember from playing with the death metal crew. I gave the PCs in a D&D game a puzzle cube to play with. The player of the wizard had never seen Hellraiser and thought "Oh, cool" and started trying to figure it out. They happened to be at an inn when the wizard finally solved it. Metal shades that definitely didn't belong to the inn lowered on the windows and the front door now opened to a smoke filled corridor. From the corridor they heard a voice say "Please explore. We have all of eternity to feast upon your flesh." At this point one of the players, Jut, leapt over the table and attacked the player of the wizard, screaming "YOU IDIOT! YOU SENT US TO HELL AND NOW PINHEAD IS GOING TO KILL US! Dude, my character beats on Chris' wizard." We calmed Jut down so Chris didn't get beaten up too much. "Look, some stuff happened. And I kind of promised the trolls that I'd come and be their shaman." One of my best RPG experiences as a player came from September Con years ago. 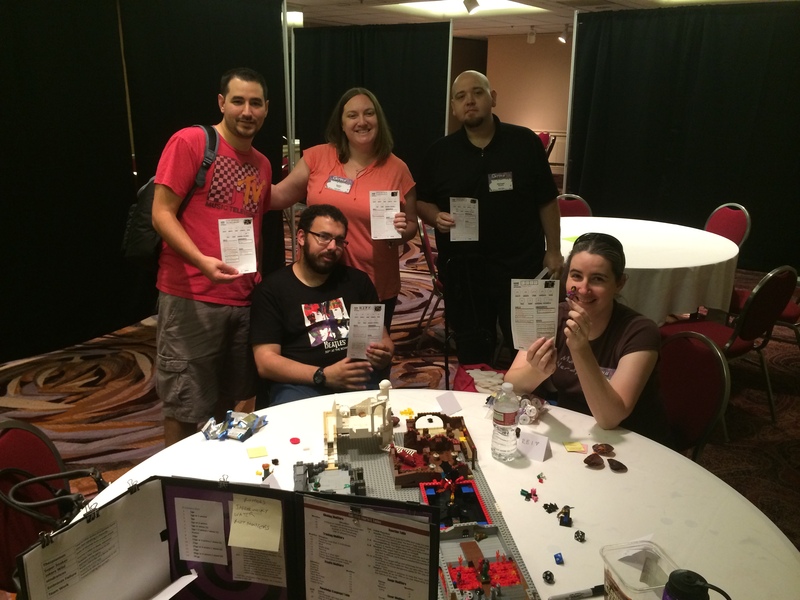 It was my first game convention since the early 90s. And while many of the games were great. One really stood out. I played a Savage Worlds game run by @tomes . Long before he went off to adventure the wilds of hippy,story, pbta games, he was known for rocking some Savage Worlds goodness with a twist. I sit down to the table and we only have 1 other player. Not a Happy Jacks listener, and new to Savage Worlds. We are presented with a simple task, it's labor day weekend after all and we the wizard (me) and the fighter (other guy). Are members of the union and we have been selected to delve into the unions Dungeon headquarters to deliver our demands to the Union boss. Once the monkeys were dealt with we were confronted with a bridge, and a matching bridge troll (all in lego 3D goodness), who came out to smash us to dust...I in turn presented our offer for proper health benefits and vacation package that I as his local union rep, was looking to push to upper management. This led to the Troll letting us pass without incident. Finally we meet the Union Boss. A greedy (lego) dragon who has no intention of giving us anything, except maybe a face full of fire breath! But hey I'm a wizard and I have a job to do! So I step out tell him we have demands and he proceeds to breath fire at me. I hide behind the corner escaping the flames, step out again slam him with my mystical power of force. Rocking him back for a couple of wounds... I then repeat that our demands are meant to be taken seriously...This time in anger he bursts forth another gout of flame, I hide back behind my pillar, step out again, rinse repeat, 3 wounds....I ask him to sign again, he refuses, so I blast him to unconsciousness. Eat my packed lunch, wait for him to wake up, standing in front of him with the scroll. "These are our demands, please sign them and we can conclude our business." It was a blast, really fun to see how someone else runs the system. And hey we beat a dragon and finished the whole thing with only 2 players! Woot Woot! JoeGun Hah! What a great writeup!! Frankly, most of the best memories come from my early days of gaming. I made some truly great, lifelong friends. Our group spent a good deal of high-quality time together while (generally) staying out of trouble. There were too many hilarious or poignant moments to recount fully in this short note. I'll try to recall a few to share. Some of those friends have since been... from this world "untimely ripped", but I will not forget them. Awesome memories, makin' me nostalgic!